The de Havilland DH.50 was a 1920s British large single-engined biplane transport built by de Havilland at Stag Lane Aerodrome, Edgware, and licence-built in Australia, Belgium and Czechoslovakia. In the early 1920s, Geoffrey de Havilland realised that war surplus aircraft would need replacing, so his company designed a four-passenger-cabin biplane, the DH.50, using experience gained with the earlier de Havilland DH.9. The first DH.50 (registered G-EBFN) flew in August 1923 and was used within a few days by Alan Cobham to win a prize for reliability during trial flights between Copenhagen and Gothenburg. Only 17 aircraft were built by de Havilland; the rest were produced under licence. The different aircraft had a wide variety of engine fits. In 1924, Cobham won the King's Cup Race air race in G-EBFN averaging 106mph (171km/h). Cobham made several long-range flights with the prototype until he replaced it with the second aircraft. The second aircraft (registered G-EBFO) was re-engined with the Armstrong Siddeley Jaguar engine and was designated the DH.50J. Cobham flew the aircraft on a 16,000mi (25,750km) flight from Croydon Airport to Cape Town between November 1925 and February 1926. The aircraft was later fitted with twin floats (produced by Short Brothers at Rochester) for a survey flight of Australia in 1926. On the outward flight from England to Australia, Cobham's engineer (A.B. Elliot) was shot and killed when they were overflying the desert between Baghdad and Basra. He was replaced by Sergeant Ward, a Royal Air Force engineer who was given permission to join the flight by his commanding officer. Also in 1926, a DH.50A floatplane was used in the first international flight made by the Royal Australian Air Force. The Chief of the Air Staff, Group Captain Richard Williams, and two crew members undertook a three-month, 10,000mi (16,093km) round trip from Point Cook, Victoria to the Pacific Islands. The aircraft was popular in Australia and licence production was agreed, leading to 16 aircraft being built there. 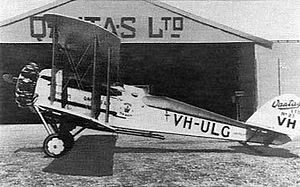 QANTAS built four DH.50As and three DH.50Js, Western Australian Airlines built three DH.50As, and Larkin Aircraft Supply Company built one DH.50A. SABCA built three DH.50As in Brussels, Belgium. and Aero built seven in Prague, Czechoslovakia. One of the QANTAS-built DH.50s (G-AEUR) was the first aircraft used by the Royal Flying Doctor Service of Australia. DH.50: Single-engined light transport biplane. DH.50A: Built under licence in Australia and Belgium. DH.50J: Powered by one 385hp (287kW) Armstrong-Siddeley Jaguar radial engine. Jackson, A.J. (1973). British Civil Aircraft since 1919 Volume 2. London: Putnam. ISBN0 370 10107 X.
Jackson, A.J. (1987). De Havilland Aircraft since 1909 (Second edition ed.). London: Putnam. ISBN0 85177 802 X.
Stephens, Alan (2006) . The Royal Australian Air Force: A History. London: Oxford University Press. ISBN0195555414.